The trees catch fire. The now-golden sunlight fades by 6 p.m. The Grady High football announcer’s voice reverberates up the street, followed at halftime by the percussion and horns of the marching band. 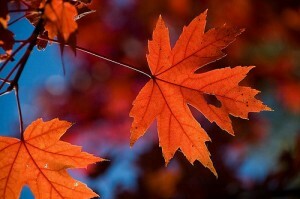 Sitting by the cold window in the dark, I feel the season’s usual downward tug on my heart. For a moment, I don’t breathe, caught in loss nearing despair. Then I turn toward the glow of the kitchen, stand, and move into the light. I chop onion, fry bacon; I stir, simmer, and season. I make my own comfort. This is pure comfort food. It’s not unbearably unhealthy, but it’s also not light. I served it with a big green salad with pistachios and the season’s first blood oranges to balance things out a bit. *Yes, you can probably use a different dairy substitute, but hemp milk is creamy and isn’t sweet, so it’s a good match for this recipe. Mmmmm…yum! I love soup! Winter (okay Rainy Season) has come to the SF Bay Area and we’ve been having Soup Night at least once a week. This looks like a delicious recipe! One of my favorites is celery potato soup. Have you ever tried making it? The recipe’s simple: saute onions, add chopped potatoes, celery, and liquid (water or broth); boil until soft. Then, give it a quick puree in the blender or with a hand mixer. It’s one of my favorites for cleaning out the fridge (gets rid of all those sad celery stalks lingering in the veggie drawer) and it looks lovely when garnished with parsley, crispy bacon and a swirl of olive oil. This sounds perfect. I’m feeling tense and shaky today–not sure if it’s the election or being by myself (my husband is out of town at work) and bad sleep–the combo just makes me sick to my stomach and the only thing I can seem to stomach is water and gluten-free crackers. Speaking of crackers, what are the crackers that are pictured in your shot? I will definitely make this. Thank you so much. This looks amazing!! I love soup season, too. 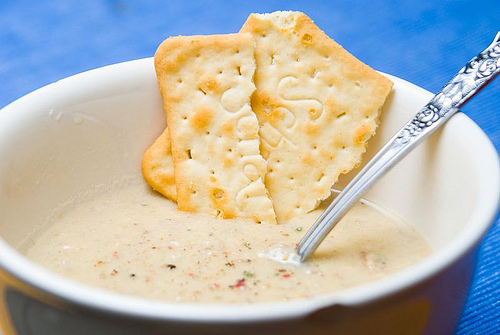 I never thought I’d be able to eat clam chowder again, but I can’t wait to make this recipe. Hannah–they are Schar gluten-free, egg-free, soy-free, dairy-free crackers. They are a little less all-natural than I like my diet to be, but they taste closest to the wheat-based version of any I’ve tried, so I eat them occasionally. What kind of hemp milk do you use? The only kind I’ve tried before has been rather watery and disappointing.